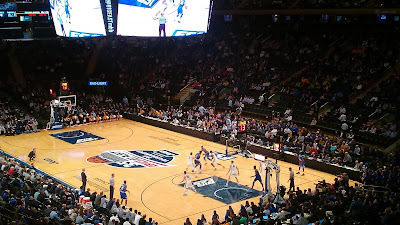 The Big East Tournament at Madison Square Garden last season. Photo by Jason Schott. The Big East Conference will once again be hosting a week of unique and engaging events which culminates in the crowning of the 2018 Big East Men’s Basketball Tournament champion on Saturday, March 10. The Big East Tournament is the longest-running college championship event played at the same venue, and it will be played at Madison Square Garden for the 36th consecutive year, Wednesday, March 7 through Saturday, March 10. The tournament starts Wednesday at 7 p.m. ET with longtime rivals St. John’s and Georgetown facing off in the first game, followed by a Midwest battle of DePaul vs. Marquette in the nightcap. Thursday delivers a huge day of Big East basketball, with four games beginning at noon. The semifinals are Friday night March 9 at 6:30 p.m. and 9 p.m. with the Thursday winners back in action. The 2018 champion will be crowned on Saturday evening with the championship game starting at 6:30 p.m. Tournament Games will be carried on FS1, with the championship game Saturday night on FOX. Monday kicks off the week of events with a Big East Men’s Basketball Tournament Bracket Fan Party at Stout NYC. To officially ring in the start of the 2018 Tournament, the Big East, along with key partners will open the New York Stock Exchange on Wednesday morning. The BIG EAST continued its partnership with Madison Square Garden’s Garden of Dreams as part of the BIG EAST Serves platform and will celebrate this partnership on Wednesday night. Friday, the BIG EAST will host its fifth annual men’s basketball roundtable. During Thursday and Friday’s sessions, the BIG EAST will be honoring some of New York City’s finest first responders. Championship Saturday will feature the Empire State Building glowing in the championship teams’ colors, capping the night dressed in the lights of the winner. All on court contests and promotions will be MC’ed by Chuck Lott Jr.
· The inaugural Big East Tournament Bracket Fan Party will be hosted at Stout NYC at Stout’s Grand Central location (East 41st Street between Park and Madison Avenues) from 6-7:30 p.m. ET. The party will include Bracket Bar specials, Big East t-shirt giveaways and pint glasses. Thanks to a promotional partnership, the restaurant will feature a Big East Burger special, debuting at the fan party. The burger will be available all week at all Stout NYC locations. · Big East Commissioner Val Ackerman along with Joel Fisher, Madison Square Garden’s Executive Vice President, Marquee Events and Operations, Big East partners, other league officials, school administrators and mascots will ring the opening bell at the New York Stock Exchange. · Major postseason awards are announced at a 4:30 p.m. press conference held at the Theater Lobby of Madison Square Garden. The Big East will present the Player of the Year, Coach of the Year and Freshman of the Year trophies along with the announcement of the Big East Scholar-Athlete of the Year presented by Sunkist. · Coinciding with the first round of the Big East Tournament is Garden of Dreams Night at Madison Square Garden. The Big East will host children from the league and Madison Square Garden’s partner, the Garden of Dreams, on the court and behind the scenes. Children will join St. John’s and Georgetown players on the court for the national anthem. Others will enjoy a behind-the-scenes tour of the FOX production trucks and Big East Digital Network sets. During the game, Big East Commissioner Ackerman will recognize the Garden of Dreams along with Madison Square Garden’s EVP Fisher. · Halftime entertainment for Wednesday night is renowned entertainer Red Panda, the NBA’s legendary acrobatic act. · Two of Thursday’s first session bands, No. 1 seed Xavier and No. 4 seed Creighton will be featured on FOX 5’s Good Day New York morning show in a Battle of the Bands live from the floor of Madison Square Garden. · In between the first and second session of the tournament, the Big East will host the Sports and Entertainment Career Networking Event. Students selected by the representatives of the league’s 10 member institutions’ career consortiums will be able to network with Big East school alumni at a catered event at the Delta Club in Madison Square Garden. · Friday’s anthem will be song by Richard Blake, part of the original cast of Broadway’s A Bronx Tale. He is currently starring as Lorenzo. He has previously appeared in Jersey Boys, Matilda the Musical, and Wicked and originated the role of Warner Huntington III in Legally Blonde the Musical. · In between the Friday semifinal games, Bronx native Bruce Harris will play God Bless America on the trumpet. Harris currently plays for the Lincoln Center jazz orchestra. · Halftime entertainment for Championship Saturday is the Drums of Thunder, a troupe of fourth and fifth grade percussionists from the Hillside Gifted and Talented Elementary School in Montclair, N.J. Louis D’Amico, founder and musical director, has been instructing this young group of musicians for more than 35 years. Saturday’s anthem will be sung by Anna Negron, a Seton Hall alum and who has sung the anthem for the past two tournaments. · As a Big East Tournament champion is crowned for the 36th time at Madison Square Garden, the lights of New York City’s iconic Empire State Building will turn to the official colors of the winning team. As the sun sets on the New York City skyline, the championship teams will share the colors on the top of this iconic metropolitan architectural structure. Tweet photos to @BIGEASTmbb and @EmpireStateBldg. Tickets for all five sessions are available at http://www.ticktmaster.com/bigeast. For more information on the Tournament visit BIGEAST.com for the BIG EAST Tournament Central. Follow along via social media hashtag #BEtourney.